In high school juggling a demanding schedule of 7 or 8 courses with as many textbooks and binders, staying organized is essential to success. 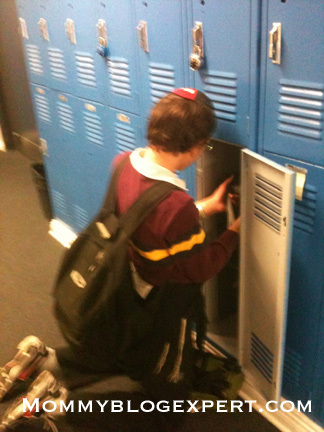 But that's often easier said than done in today's schools where bare bones lockers are the norm. Sure there are those wire grid shelves you can buy at dollar and office supply stores that can be added to a student's locker. The problem is these are typically flimsy, resulting in a single shelf one-size solution that may not fit the locker. What's worse is these inexpensive shelves can fall apart easily and collapse, sending the locker's entire contents tumbling. So when my family had the chance to test a new Double Locker Shelf solution from LockerShelf that is flexible, fits like built-in shelving and made to last, we seized the opportunity. For this test, we received the 12" Double LockerShelf for review. True to the manufacturer's claim, this innovative patented shelf was quickly and easily installed in just four steps in about 3 minutes by my slightly nervous ninth grader on his first day of high school. Functionality afforded by not 1 but 2 shelves for storage of books with the middle shelf sized to manage the bulkiest binders and larger heavy items. Strong and durable shelf components that are precision cut so a student can easily assemble and customize on their own without any tools or special building talents. Interchangeable shelves that can be added or removed after it is initially installed, as well as the ability to completely remove the unit and reuse in different lockers from year to year. Construction of 70% recycled hollow-core PVC that yields incredible strength of up to 150 pounds. The Double LockerShelf reviewed for this post, as well as information about other similar quality locker options ranging in price from $16.99-$39.99 plus shipping, are available on the LockerShelf site. 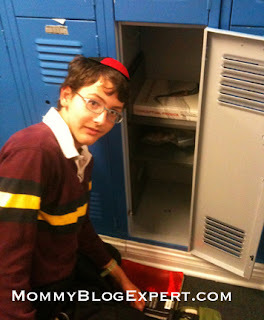 How do you or your child solve locker storage issues? Would love to hear from both parents and students on what works best for you and why. FTC Disclosure: I received the Double LockerShelf from LockerShelf Company to facilitate this review. However, MommyBlogExpert did not receive any payment or other compensation associated with this post. See complete FTC Disclosure information that appears at the bottom of MommyBlogExpert's main page and at the bottom of every individual post on this blog, including this one.